When you have a family and think about moving to a new home, choosing the right neighborhood is a pretty challenging task. It’s not only a question of the number of options you have. Considering the rising prices for real estate, it’s also about the places you can afford. That’s why it’s not so easy for a young family to move to a perfect family neighborhood. Wondering what neighborhoods are most family-friendly in each borough? Check out our list! Decided to raise your kids in Brooklyn? Great idea! There are more benefits, than drawbacks in it. As we have already mentioned, it’s the most populated borough of New York, with plenty of cultures living within its neighborhoods. Thinking about the best neighborhood for a family with kids to live in, we have decided to highlight our top three. Located on the hill that leads to Prospect Park, this part of Brooklyn seems like a small town of its own. It’s a safe neighborhood with low crime rates and wonderful public and private schools. There are also a big number of communities and amazing restaurants you will want to return to. You will see so many families with kids that it seems like you’re supposed to have at least one, too. You can always find a place in Park Slope to have great times with your kids and the entire family. Take them to a dance studio, design lab, art houses, and multiple playgrounds. Go barbecue or take a tour on the electric board in Prospect Park. Your kids can literally do anything. Unfortunately, not everyone can afford living in this paradise for parents. An average monthly rate is $3,200, but it can be up to $10,000. According to the landmarking rules, developers cannot build high-rises in Park Slope. That’s why townhouses and apartments are so expensive here. There is a dirty little secret about Park Slope. It is the crime in the neighborhood. Many of problems are about property crimes. Total crime is 879 per 100k people. Don’t forget to mention this when lowering the price of your apartment. Located between Clinton Hill and Downtown Brooklyn, it’s a safe neighborhood with beautiful families, young urban professionals, artists and life-long residents. People in Fort Greene have an upper-middle income, which makes it an above average income neighborhood. Home to writers Walt Whitman and John Steinbeck, Fort Greene is also famous for its flea and farmers’ markets, where you can definitely spend some of your Saturdays. Your family can also lounge in the greenery of Fort Greene Park designed by Calvert Vaux and Frederick Law Olmsted. Located in the center of the neighborhood, this gem draws visitors from Brooklyn. DeKalb Avenue is an amazing restaurant row to surprise your senses. There are also plenty of child-friendly restaurants in this perfect neighborhood. Your entire family will find plenty of places to eat, play, relax and shop. More and more people are moving to settle down here. 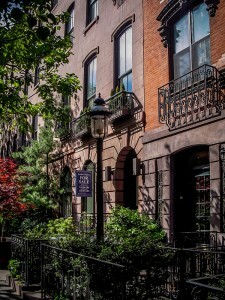 Most residents live in charming brownstones and row houses. The average rental price here is $2,500, which is lower than in Park Slope. Located on the southwest side of Brooklyn, Bay ridge used to be one of its Italian neighborhoods. Today, a diverse mix of cultures lives here and all of them enjoy both the small-town feeling and proximity to the city. As for its city-like qualities, the neighborhood’s stores stay open later, late night delivery is available, and even the train runs late all week. Bay Ridge offers a variety of restaurants: Mexican, Italian, Japanese, Spanish, Eastern European and Middle Eastern, and these are not the whole list. Yelp will help you to find the best kid friendly restaurants. They also say you can find a bar on literally every block of this friendly neighborhood. Bay Ridge residents say it’s a great place to raise kids. It’s the golden mean between the city and suburban areas. In addition to playgrounds you will find throughout the neighborhood, Shore Road Park and Owl’s Head Park are the major greenery places. Speaking of parks, on October 31 Bay Ridge families go to Owl’s Head Park for its big annual Halloween Haunted Walk & Fairytale Forest. As rent prices in Brooklyn keep rising, a lot of people find Bay Ridge a reasonably priced and family-friendly neighborhood to move to. An average price for a two-bedroom apartment here is about $2,100. The residents of this borough say it’s a great place to raise kids. Its neighborhoods may not be as posh as in Manhattan and as vibe as in Brooklyn, but that’s exactly why the Queens families like living here. Apartments are affordable, schools are great, parks and playgrounds are numerous. What else do you need? Being only five subway stops from Manhattan, it seems they’re decades away from each other. You won’t find many high-rises here, but Tudor and Georgian style buildings instead. This neighborhood is known as one of the most family-oriented ones in Queens. If you want to escape from the city, but not to leave it completely, Forest Hills is perfect for you and your family. It is quiet enough to raise kids, and close enough to Manhattan at the same time. By the way, commuters can use not only subway, but also Long Island Railroad. The neighborhood doesn’t have as many restaurants as, say, Park Slope, but the places offering great food keep running for decades. Their services and great food will make you love the nabe. Go to Forest Park to enjoy a bike ride with your kids or a horseback riding. You can do anything here, from swimming to golf. If you enjoy shopping go to Austin Street and its trendy stores, while Metropolitan Avenue will offer you more casual brands. Median rental price in Forest Hills is $2,100. Since the price is more or less affordable, a lot of young families move here. It’s a lively, safe and diverse neighborhood with great Greek and Italian food and welcoming atmosphere in the northwest Queens. As more and more people keep moving to this special place, new cafes, restaurants and shops keep opening all the time. A lot of space and greenery make the streets calm and cozy. It’s easy to commute to the city from here. At the same time, the atmosphere is urban-like and easy. The neighborhood has its own attractions, such as Astoria Park with its massive public pool, Athens Square Park, the Museum of the Moving Image, Bohemian Hall and Beer Garden. Astoria’s markets should also be mentioned here. Just imagine the counters loaded with feta and olives, and also lots of butchers and delis. You can celebrate your kids’ birthday in Bounce ‘N Play or Raising Astoria. Are your kids into swimming? Take them to Astoria Sports Complex Kids. Astoria also can offer you great dance studios, such as Sol Dance Center and Astoria Dance Centre. The good news is that you can most likely afford this cozy neighborhood. The median rate in March was $2,200. Give the Bronx a chance, especially if you’re priced out in Manhattan and Brooklyn. The mix of neighborhoods is vivid and diverse. Check out the two we’ve selected for you, and you will definitely fall in love with one of them. The northernmost border of not only the Bronx, but the entire New York City, Riverdale is a cozy nabe with lots of trees and friendly neighbors. It’s the best option when you need an apartment with at least three bedrooms. The Bronx rental prices are most affordable in NYC. The contrast of co-op buildings and pricey mansions even adds to the neighborhood’s attraction. Don’t you worry, Riverdale has the lowest crime rate in the Bronx. There are plenty of mothers strolling with their kids in the streets. By the way, Riverdale has NYC’s top three schools. A Saturday night here is rather quiet, so those looking for nightlife should not choose Riverdale as their new home. Take your kids to the 1146-acre Van Cortlandt Park for biking, hiking, swimming and enjoying nature. Go to the amazing Riverdale Park and enjoy the magnificent view. Don’t miss Riverdale library’s weekly toddler and baby storytimes. Just like other neighborhoods, Riverdale has its traditions. Its residents celebrate the Hudson River at the annual Riverdale River Fest in June. You should definitely go there with your entire family, and enjoy boat shows, music, and lots of family entertainment. Country Club is mostly upper middle class neighborhood of the Bronx. Running along Eastchester Bay, it’s a small quiet place perfect for both raising children and aging. Want to live in the countryside with tree lined streets and still be close to the city? Country Club is perfect for you! The views you will find there are amazingly picturesque. Country Club’s residents have lived here for decades, and everyone knows each other well. The family-friendly atmosphere is in the air. There are no subway stations, so you’d better have a car to go everywhere. The drawback lies in limited dining and shopping options, but you can still find some nice places in Country Club. Rental prices here are higher than in the rest of the Bronx, but they are still more affordable than in Brooklyn. You won’t find a lot of Country Club apartments on rental websites, but friends and family of the residents will definitely know about them. So, the best way to find an apartment there is having someone you know in the area. Coming to Manhattan you realize why New York is considered to be the centre of the world. Its world-class museums, greatest restaurants, and magnificent views make more and more people stay there. 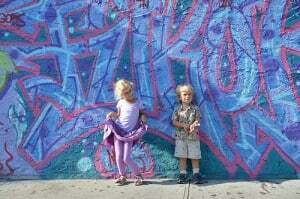 Let’s take a look at Manhattan’s most family-friendly neighborhoods. The Upper East Side is a classic and chic part of NYC. There’re tons of restaurants, multiple shops, parks and first-rate museums. It is perfect in all the terms: low crime, family-friendly atmosphere, and thousands of trees. The green gems Central Park and Carl Schurz Park are east and west borders of this perfect neighborhood. There is one drawback that can be actually counted as an advantage. It’s the lack of subway access. That’s why some people think of this area as one hard to get to, which is good for the neighborhood residents. But when you have a kid, it’s easier to use a bus. You don’t have to go downstairs with a stroller all the time. Plus, buses are less crowded. It’s hard to walk a block without finding something interesting to do with your children. The number of family-friendly destinations is tremendous. No matter how old your children are, you will easily find an entertaining activity for each of them. The Upper East Side has exclusive private schools you may already have heard of: The Dalton School, The Rudolph Steiner School and The Spence School, Your kids can also go to some of the city’s best public schools, such as P.S. 290 (The Manhattan New School) and P.S. 6 (The Lillie Devereaux Blake School). Unfortunately, it’s hard to find an affordable apartment in this part of NYC. The median rent here is $9,000. But everything’s possible, right? It goes without saying that the Upper West Side is a paradise for all families. There is a bunch of best private schools, like the Trinity School, Ethical Culture Fieldston School, and the Calhoun School. The neighborhood is also home to such popular family attractions as the Children’s Museum of Manhattan, the American Museum of Natural History, Central Park and JCC. It’s a more relaxed place than the Upper East Side. Plus, a lot of restaurants are kid-friendly. Some streets lined with brownstones have that small-town feeling some people are longing to. Most residents (72%) of the Upper West Side use public transport and only 12% commute by car. An average rent for a two-bedroom apartment is $5,000, which is not much affordable. But if you’re one of the lucky ones to afford moving there, get the most of it. You can choose between co-ops, condos, and high-rise buildings. It’s no brainer why Battery Park City keeps attracting families. Low crime, the best school district in Manhattan, beautiful parks, multiple shops and restaurants, great access to subway stations – all of this makes the neighborhood so family-friendly. Living here feels like you’ve escaped the big city to a suburb, but still can easily commute to work. BPC is famous for its parks and playgrounds (Nelson A. Rockefeller Park & Playground, Teardrop Park, West Thames Park), but there are also lots of indoor events offering family activities. You can go to kids’ programs in museums, or puppet shows and various kids’ concerts. The local New York Kids Club is a great place where your children can enjoy even pajama parties. Attend educational programs at the Poets House Children’s Room, experience multiple family events. Located at the bottom of Manhattan, BPC is more affordable. The median rent in March was $3,500. Since the neighborhood is relatively new, most buildings are not older than 30 years. Some high-rises can let you enjoy a magnificent view of the Hudson River. Since Staten Island is the least densely populated borough of NYC, its residents have more space to enjoy every moment. The coastline attractions and family-friendly activities make this borough a great place to live. Located on Staten Island’s south shore, Huguenot doesn’t have a lot of traffic within its borders. But the neighborhood can offer its residents access to beaches and the South Shore Country Club. Your family will feel safe in this quiet place. If you move to Huguenot, your kids will go to one if its great public schools. The median rent here is only $1,200, which this friendly neighborhood even more interesting. The architecture includes modern family homes and high-end townhouses. It’s a great place for families with kids. Population density is very low here, so you’ll have more space to breathe. This neighborhood is much safer than other places in New York. The neighborhood has great schools, even some of the best ones in NYC. By the way, the results of the average school test in Great Kills are 9% higher than the national average. Rental prices are pretty low here, and the market is stable. An average rent is about $1,400. Most households are owner-occupied, and only 17% are renter-occupied homes. Maybe you think that some other neighborhoods are more family-friendly than the ones we have listed above? You’re most welcome to share your thoughts in comments.